Leggy Jean Color Code Inc.
What better use of long, leggy jeans than to broadcast the fit, style and brand via color codes. 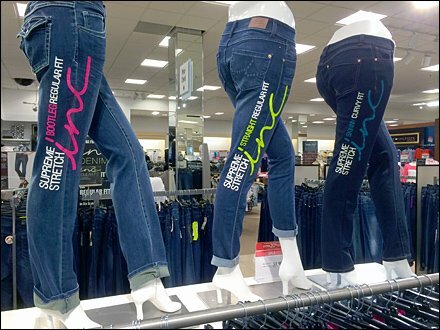 See that both the brand and jean cut are colorized. I might have used extended workspaces to improve the readability just a tad, but the idea of billboarding a pant leg is fun and fresh. CLICK through the gallery for a better look at the legs.